Meet captain MEERA KHANNA..the first officer of aeroflot aviation plane ..who is blessed with a luxurious apartment in MANILA , blessed with all the amenities in a beautiful country , navigating flights and being a girl who is always busg handling typhoons and engines failure all in a day's work..! But only after such a tragic moment , MEERA faces a leg injury and that forces her to take a week off from her busy schedule.. meanwhile she gets an exciting vacation to subic bay with her pretty_glamarous_sizzling yet innocent looking best friend diana , aka dee.. and the arrival of his suave best friend ADITYA add charm to the vacations ...but what intentions do aditya have ? Do aditya wants something more than friendship ? What will happen to meera's life ? 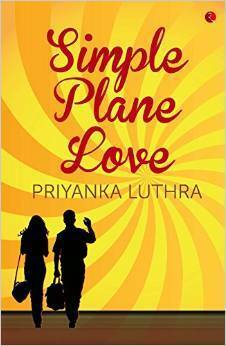 Will her perfect life come to an abrupt landing or will she get a perfect happy ending ? So join..captain meera on her rocking adventure where navigating a plane is quite simplier than handling a love relation with lots of twists and turns.. This novel seems like more of an autobiography and has the creating of her own profession..
All in all it' a good atempt for a beginner but i m sure priyanka luthra will hone her skills subsequently ..!